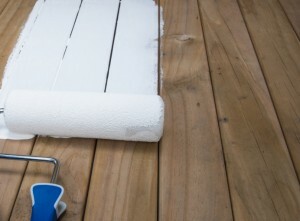 A fresh coat of paint can revitalize your wooden deck! A wooden deck will inevitably experience weathering over the years. One of the best ways to extend the life of your deck is to paint it. Also, applying a fresh coat of paint is a great way to enhance the curb appeal of your property! If you plan on painting your deck, check out these helpful tips! In order to achieve the best results possible, you want to be sure to clean your deck before you paint it. You can either use a scrub brush with a detergent or a pressure washer. If you opt for the pressure washer, just be sure not to hold the nozzle too close the surface. If you hold it too close, it can severely damage the wood. After you are done washing your deck, you want to be sure to let it dry. You never want to apply paint to wet wood. This is because the wood will deteriorate and mold will form. Also, the paint will flake off, which creates a safety hazard for pets and young child. If you have any holes in your deck, fill them with a high-quality putty before you begin painting. Use sandpaper to ensure the surface is nice and smooth.